The St. Paddy’s Day 5K will take place on Saturday, March 16, 2019 at 9 a.m. Registration and check-in will begin at 8 a.m. in the Kent State KIVA. The race will start at Risman Plaza and loop through the university on the Black Squirrel 5K route. Food and drinks will be provided for race participants. There will be medals for overall and age group winners and each participant receives a tech shirt. Students, employees, alumni, family, friends and anyone really, are encouraged to Run for Gold to support philanthropy at Kent State. Or just for fun. Or you can walk. Or just to get outside again. Whatever your reason, know it’s for a great cause! 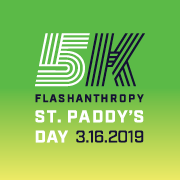 The annual St. Paddy’s Day 5K was created to promote the message of the organization - to “Pay It Flash Forward” to the Kent State community while also providing a fun and competitive event that supports student and employee wellness. FLASHanthropy is the official Kent State University student organization committed to educating Kent State students and the community on the importance of giving back during and following their time at Kent State. 9 a.m. Registration and check-in will begin at 8 a.m. in the Kent State KIVA. The race will start at Risman Plaza and loop through the university on the Black Squirrel 5K route. 9 a.m. Registration and check-in will begin at 8 a.m. in the Kent State KIVA.